Construction activities are wrapping up on the Phase I of the BART Silicon Valley project and noise and vibrations from construction activities have significantly decreased. With the exception of some minor activities through the end of the year, pile driving, earth moving and major detours are long over. However, now that trains are actively running on the new tracks as system testing takes place, nearby residents will begin to hear a different tune. 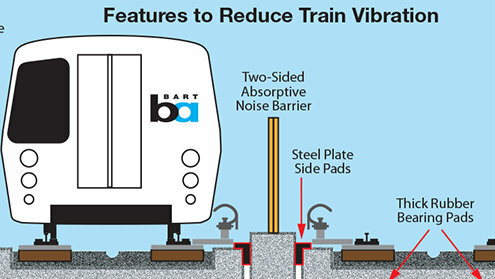 Transit noise and vibration are generated by BART trains in motion. The noise comes from the electric motors that propel the train and the rolling noise of the steel wheels on the tracks. Vibrations result from the weight of the train rolling over the tracks. After extensive sound testing, VTA utilized multiple construction techniques to minimize noise impacts to nearby residences and other nearby facilities, all meeting federal noise standards. They include construction of new sound walls, insulation of existing structures, equipment enclosures, floating concrete slabs underneath tracks and the use of Tire Derived Aggregate (shredded tires used as a vibration absorbing material) – a construction technique successfully used by VTA on the Vasona Light Rail Extension.